The basic Eight Palaces Gua is arranged in the order of Kin, Chan, Ham, Kan, Kwan, Shun, Lei and Tui, with Kin commands 3 sons while Kwan accords 3 daughters. Such systematic arrangement with little changes cannot explain the Yin and Yang concept and the changes within. On the other hand author has different view on such issue. 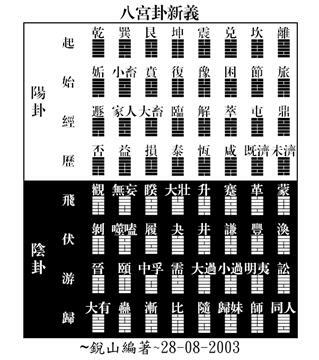 The arrangement of Eight Palaces Gua in order of Kin, Chan, Ham, Kan, Kwan, Shun, Lei and Tui, with Kin commands three sons while the Kwan accords three daughters, this is the general conviction of most I-Ching scholars. With no dispute that Jin Fang finding was base on the text of “Shui Gua Chuan”. It is based on the arrangement of Eight basic Guas as Eight palaces; with each Gua has it own six Yaos, called ‘Chong Gua”, the two sets of three Yaos stack on each other to become six Yaos of ‘Chong Gua’. Every palace gradually changing the first Yao to become a new Gua. For instant, six Yaos of Kin Gua with changes in first Yao has resulted first three Yaos still a Kin Gua and the upper three Yaos become Shun Gua called Tian Feng Guo Gua and so on. The fourth changes swayed away from Kin and change from Kin to Kwan. As a result of such conflict with Kwan Gua, therefore the six changes revert back to fourth Yao changes, as result Fire Earth Chun Gua emerged as Yu Wen Gua and last Gua with Gui Wen Gua. Such changes are acceptable and recognized by many scholars and also the sole explanation on Jin Fang Eight Palaces thus far. So far such changes would only explain the changes in the Gua within the eight palaces and nowhere to explain the Yin and Yang concept. ‘Jin Shi Yi’ constantly discussed the Yin and Yang in line with the concept of changes that evolved around Yin and Yang, with Yin set and Yang rise and vice versa. Such changes involve the cosmic and human indefinitely. I-Ching scholar arranged the Eight Palaces Gua accordingly but that could not be his intention to begin with. Such arrangement did have flaws and sad to know that it cannot perform to fullest. For example, how the 4 main Guas and 4 corners Guas perform and function appropriately? How to interpret the meaning of ‘Fei Pu Yu Qiu’? Every Gua and every Yao has its own Yin and Yang, Si and Ying’s Yin and Yang, the Lok Shu magic number’s trail and so on. Today let me explain briefly such queries. ‘Jin Shi Yi Chuan’ mentioned that Fire and Metal in Period 2 combined as Earth’s Koon, it is a conviction that the Eight Palaces Gua is based on the Lok Shu magic numbers, 94 as metal, 16 as water 27 as fire, 38 as wood and things repeat it selves every ‘six’ multiple, it is related to eight sequential steps of life journey which begin with start, ignite, journey, experience, fly, hibernate, swim and return. That as a result the 64 Guas are emerged. The observation of comic stars and the changes of topography or landform in which end up with the beginning is synonymous with life and death of living beings. ‘Start’ is explained as a mother who gave birth to new born and the baby start to cry and relevant to the beginning of life force, ‘Journey’ is the journey of life, ‘experience’ is the process of going through the path that might bump into ups and downs of life, which is also the ugliness and happiness of living beings. ‘Chung’ is the sickness and aging process that lead to death. ‘Fly’ is the emotion and feelings related to happiness, kindness and Yang part of life, ‘Hibernate’ is hidden with opportunities and threats, unforeseen circumstances and sadness or Yin part of life. ‘Wander’ is path of life after death and ‘Return’ is associated with reincarnation of living beings. ‘Begin’ is associated with the beginning and ending of life forces. The combination of both Yin and Yang existed in line with the formation of Guas that begin with Fly, Hibernate, Wander and Return in ‘Chong Gua’ with the track of Lok Shu magic square. This is critical symmetrically to the journey of life forces. Chu Xi mentioned ‘The ignition of Heaven and Earth has resulted in Yin and Yang, the interaction of the two energies has created life forms and forces. This creation has led to the forming of identify. Life and death, male and female, static and dynamic, contract and expand, up and down, whole and part, solid versus gases and the list goes. Jin Fang has placed great emphasis on the Yin and Yang concept. This has led to the conviction of using Eight Palaces Gua. The Yin and Yang not limited to the Eight Palaces Gua but the Yaos in between the Guas. This is the real essence to explain life form.